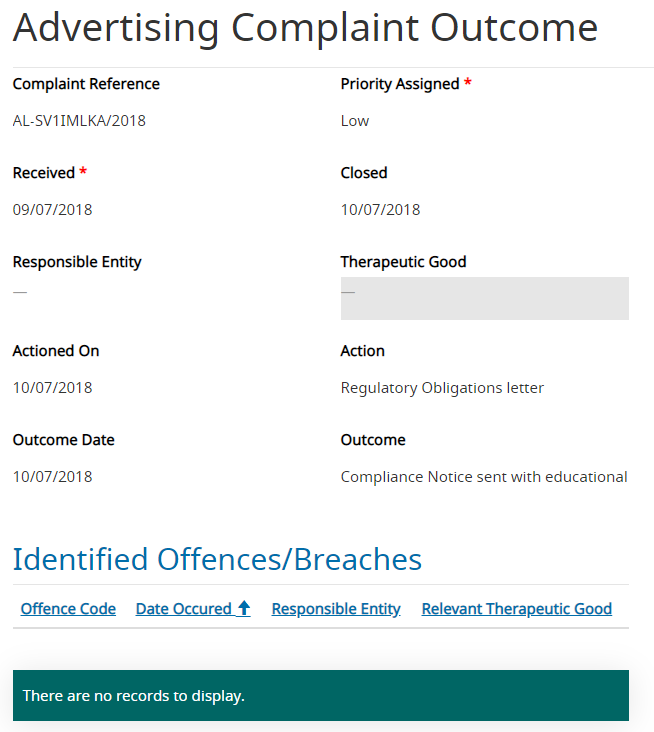 “The new system will be more transparent than the previous one, apart from publication of TGA’s performance against key performance indicators detailed information on individual complaints will be published for medium-, serious- and critical-level complaints. Information on numbers and frequency of low-level complaints and on complaint trends will be published in biannual reports”. Provide complainants with the priority level their complaint is assigned until they are informed of the “outcome” (appended). Provide information (compliant determinations) to the complainant (or the public) on whether the Code breaches alleged by the complainant were upheld or not (as the current CRP does). Routinely evaluate (or publicise) if the regulatory action taken achieves compliance, such as sending “regulatory obligation notices” (for cases judged low priority) or “warning letters” (for medium priority cases). For the low-priority cases, merely sending a notice closes the case; for medium-priority cases, receipt of “an acceptable response” apparently closes the case. Indeed, the TGA states that an “acceptable response” is only likely to be checked if the complaint is assessed as critical (page 14 of the consultation document). Yet, experience with the current CRP shows that many sponsors will assert they will fix the problem, but then don’t, especially for second level advertisers that copy the original advertising material, such as Chemist Warehouse. Alternatively, sponsors may correct the breaches pointed out, but then create new ones. Monitoring compliance is essential; trusting advertisers is naive! The current trust-based system has led to an 80% non-compliance figure found when the TGA performs their limited number of post-marketing assessments on complementary medicines. In short, the “detailed information on individual complaints that will be published for medium-, serious- and critical-level complaints” would appear to be only that a complaint has been received on a certain date, the product involved, the company responsible (for high & critical cases only) and the outcome, “enforcement action taken”. NOT compliance achieved! See also our submission to the TGA consultation on complaint handling. 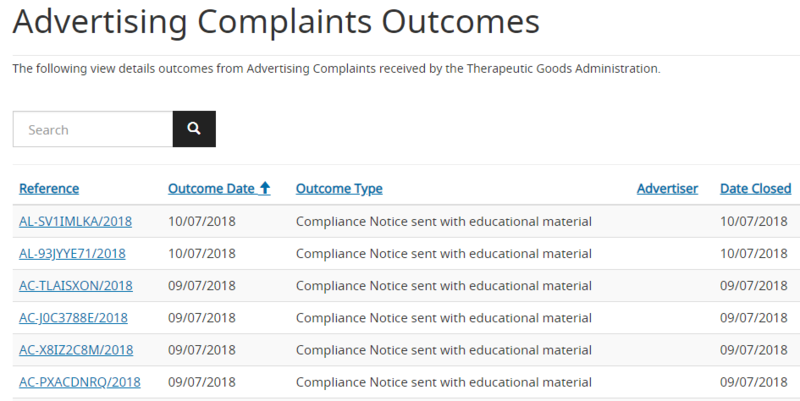 This entry was posted in Complementary medicine, Pharmaceutical Promotion and tagged advertisments, Complaint Resolution Panel, consultations, Regulatory Reform, submission, TGA, TGA Complaint system, Therapeutic Goods Advertising Code. Bookmark the permalink.